Hmmm something is different…something is different and I can’t seem to put my finger on it. Well, only because you shouldn’t put your finger up your nose. 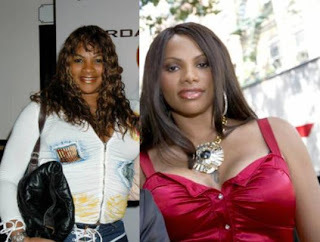 Is Pepa from “Salt-n-Pepa” the new Jennifer Grey? For those of you young kids out there that don’t get the “Jennifer Grey” reference, feel free to use this example: Is Pepa from “Salt-n-Pepa” the new Ashlee Simpson? I love love love when plastic surgery (allegedly) makes you look like a completely different person. If I were to get plastic surgery I would want to end up looking like the father from “Gimme a Break” but I digress. Anyway, can I be a huge loser (more than normal) and say I am pumped for the Salt-n-Pepa reality show on VH1? I am. I also have this disease where it is not possible for me to say or hear someone say “salt and pepper” and not start rapping, “Salt n Pepa’s here and we’re in effect want you to push it babe.” No joke, I can’t NOT do it. Maybe it’s a form of OCD. So, I’m psyched for the show, but only because I am relieved it isn’t another dating type of celebrity reality show. Let’s wait and see what kind of a train wreck it is, and if it is truly a train wreck, maybe I’ll end up recapping the piss out of it. Justin Guarini the New Jennifer Grey?